The Blurb: Buckle up and hang on tight -- the discovery of a parallel universe launches you into the adventure of a lifetime! Mario and Luigi, two wacky plumbers, undertake a daring quest to save a princess in "Dinohattan" -- a hidden world where the inhabitants evolved from dinosaurs! Mario (Bob Hoskins -- WHO FRAMED ROGER RABBIT) and Luigi (John Leguizamo -- REGARDING HENRY) face deadly challenges from a diaboloical lizard king (Dennis Hopper -- HOOSIERS) and must battle giant reptilian goombas, outwit misfit thugs, and undermine a sinister scheme to take over the world! Blast off for nonstop excitement with SUPER MARIO BROS., the live-action thrill ride that dazzled moviegoers everywhere! Is it as bad as everyone says? Not really. Check it out for yourself at Amazon! Get an Amazon Exclusive limited edition bundle complete with a New Super Mario Bros. Wii game, a set of four Wii Remote Static Clings, and a 100% cotton t-shirt (men's size large) packaged in a collectible plastic lunch box. Available while supplies last. Officially licensed by Nintendo. Note: The Wii Remote controllers pictured with the controller skins are not included in this bundle. 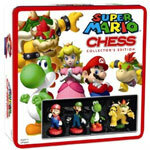 Series 1 collection figure set of 6 includes: Mario, Luigi, Yoshi, Paragoomba, Bullet Bill, and Bob-omb. Each figure measures approximately 2" tall. The Bob-omb and Paragoomba measure approximately 1" tall. Each figure is highly detailed and will make as fine decorations on your desk or shelves! Recommended for ages 7+. It’s America’s all-time #1 dice game with a Super Mario twist. Shake the dice in the custom “? Block” dice cup and watch the Super Mario icons fly. Will you roll a Large Straight with Coin, Red Mushroom, Fire Flower, Yoshi Egg and Star? Or will you roll five Green Shells? That’s Yahtzee with a Super Mario twist. Game comes complete with a custom “? Block” dice cup, 5 custom dice, score pad, rules and pencil. Created with you fans in mind, this Nintendo Super Mario Collector's Edition Yahtzee Game features 5 custom dice that are decorated with power-ups from the Super Mario video games: Coin, Fire Flower, Yoshi Egg, Star, Green Shell, and Mushroom! It also includes a collectible, travel-sized Super Mario dice cup. Order yours today! A great gift idea for Mario fans. These plush and soft slippers feature the Yoshi in all his green goodness. One size fits all. The front is made of soft pillow like materia to keep your feet feeling great. These are licensed Nintendo imports so they may have some collectible value for old-school gamers. They also come in red. Forget your average Band-aid type plastic strip bandages. Super Mario Brothers comes to the rescue! This pack of officially licensed bandages contains 15 plastic strips featuring all your favourite Super Mario Brothers characters, including enemies. These strips aren't latex free and are not recommended for children under the age of 3. Gamers will love these.